SAMSUNG HAS ANNOUNCED the launch of GALAXY Note 10.1, a device that’s designed to combine the functionality and precision of a pen and paper with all the capabilities of a state-of-the-art tablet. The 10.1 inch screen-equipped GALAXY Note 10.1 features a 1.4GHz quad-core processor and 2GB of RAM to make multi-tasking effortless and fast – the Note 10.1 is basically set up to allow users to switch back and forth between multiple apps to enhance the content creation abilities of the device. The Note 10.1 incorporates a number of key intuitive features and capabilities, including side-by-side multitasking and Samsung’s S Pen, which allows users to write and draw directly on-screen with the supplied stylus. With the Note 10.1’s Multi Screen feature, users can run two different applications side-by-side simultaneously for easy multitasking. For example, users can view web pages, videos or email on one half of the screen while writing or sketching ideas with the S Pen on the other half of the screen. Furthermore, users can capture and crop images on one side, and then paste them onto the other side of the screen. The S Pen is embedded directly in the device and, when removed, automatically launches specially optimised applications, including S Note, S Planner, Crayon Physics, Adobe Photoshop Touch, and Polaris Office. Alternatively, users can easily set their preferred application to be launched instantly when the pen is removed from its slot. The device also includes a 5-megapixel main camera and a 1.9-megapixel front-facing camera. There’s an SD card slot too, which is always a nice touch. The question has to be whether or not we need what is effectively an iPad-class device with a pen? Based on a short session with the Note 10.1, there’s method to the madness – the pen certainly is a precise and intuitive way to interface with a tablet and it makes far more sense here than it did on the original strangely sized Galaxy Note. We’ll try to dig up a review unit soon. 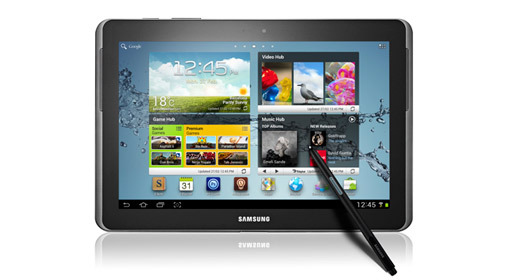 The GALAXY Note 10.1 is available in New Zealand from the end of August at $999 for the 3G/Wi-Fi model and $799 for the Wi-Fi only version.